As the Department of Defense (DoD) Independent Review Panel made clear in its report, “the initial response to the incident was prompt and effective.” Fort Hood’s use of an Active Shooter Response (ASR) model saved lives. Without question, prior mass casualty management and training, investment in emergency equipment and coordination with civilian law enforcement and emergency response personnel made a difference. Still, the DoD Independent Review Panel identified 79 recommendations for consideration and/or implementation DoD-wide to reduce the likelihood, react to and recover from future incidents. While much has been accomplished, we believe that more can be done. Subsequent to the publication of the DoD Independent Review Panel’s report, the Secretary of Defense directed the Services to report back to the Assistant Secretary of Defense for Homeland Security and Americas’ Security Affairs (ASD(HD&ASA)), the Services internal review and assessment of “their organization’s ability below the headquarters level to identify internal threats and force protection (FP) and emergency response programs, policies and procedures.” In response to the Secretary of Defense’s directive, the Army Vice Chief of Staff (VCSA) established the Fort Hood Army Internal Review Team (AIRT). The result of the Internal Review Team’s effort is this report. 1. All installations must have an Emergency Operations Center (EOC) that is fully capable. 2. All installation staffs understand the reporting chain is through the senior commander, simultaneously to the Army Operations Center and the respective Army Service Component Command (ASCC); ASCCs report to their Combatant Commander. 3. Installations maintain current and comprehensive agreements with key emergency responders in the local community (law enforcement, fire, medical, etc.). 4. Installation staffs must exercise 1 through 3 above frequently. In response to the DoD directive to review and assess the Army’s ability below the headquarters level to identify internal threats and FP and emergency response programs, policies and procedures the Fort Hood AIRT: visited 17 installations; conducted a data call from Army Commands (ACOMs), Direct Reporting Units (DRUs) and the Army National Guard; and surveyed over 80 installation commanders. The installation commanders emphasized the need for funding and personnel to meet additional protection requirements, the demands that result from implementation of the DoD findings and recommendations and the need to sustain existing equipment. The Army focus is on providing installation commanders the tools they need to support the senior commander’s FP mission. However, the demands of internal and external threats require us to sharpen our focus. To meet these mission critical tasks, the Army must evolve and transform. Our 17 site visits highlighted an important point: the Army is not homogenously-based. Incident reporting practices overseas and incident reporting in the Continental United States (CONUS), coupled with Joint Basing, lead to varied reporting practices. As Fort Hood demonstrated, communication is critical to timely response. ACOMs share concern for prompt, uniform and comprehensive reporting procedures. Installation commanders said they were hampered in their reporting efforts by multiple reporting chains and report formats. In our report, we recommend the Army G-3/5/7 (G-3/5/7) publish incident reporting procedures from installation level to Headquarters, Department of the Army (HQDA). The Army was well along a path of change prior to and immediately following the Fort Hood incident. Many initiatives were already in progress to mitigate the insider threat. IMCOM published a campaign plan. Medical Command (MEDCOM) installations will transfer to IMCOM control by the end of fiscal year (FY) 2011. Army Materiel Command (AMC) and IMCOM are using four installations to conduct a pilot to determine how to transfer AMC special installations to IMCOM control. The Comprehensive Soldier Fitness (CSF) program represents the Army’s investment in readiness of the force and quality of life for our Soldiers, Family members and Civilians. The goal of CSF is to increase resilience and enhance performance by developing the five dimensions of strength: physical, emotional, social, spiritual and family. In order to increase resilience in health care providers, the Army Office of the Surgeon General (OTSG)/MEDCOM initiated the Care Provider Support Training program, and others, with additional emphasis for behavioral health providers. All of these efforts were on-going prior to 5 November 2009. Immediately following the Fort Hood incident, the Army Chief of Staff established the Insider Threat Task Force on 16 November 2010, led by the Army G-2 (G-2) and IMCOM Commander that has produced distinctive results in the areas of counterintelligence (CI) and security. Our “deep dive” identified best practices that warrant consideration for adoption across the force: FP assessments of all ACOMs, DRUs and ASCCs by the G-3/5/7 once every three years; the CSF directorate and program; civil support team training; comprehensive and current memoranda of understanding between installations and local emergency response capabilities; cooperative annual emergency response training with local authorities; empowering supervisors as case managers in employee injury and death cases; partnering with industry in no-cost relationships to provide state of the art technology; FP compliance worksheets; situational intelligence reports for special events; designated Family Assistance Center (FAC) Teams; computer back-up programs; and using emergency operation equipment that is interoperable with that of local authorities and responders. The Army is moving forward on the recommendations contained in the DoD Independent Review Panel Report. The DoD report focused on five major areas: Personnel, FP, Information Sharing, Installation Emergency Response and Health Affairs. Of the 79 recommendations, the Army has implemented 21 of them and is in varying stages of implementing or partially implementing 45 recommendations pending DoD guidance/policy. The remaining 13 recommendations require DoD policy updates and/or revisions in order for the Army to commence implementation. In our Personnel review, we found in general the Army has sufficient personnel policy guidance for implementing personnel support programs and services. In some cases, however, personnel policy guidance and programs address unique requirements such as mass casualty, crisis incidents, workplace violence and religious accommodation. To address these update requirements, the Army will provide interim guidance while awaiting development and release of formal DoD policy. The Army G1 and Office of the Chief of Chaplains (OCCH) will lead these efforts through work with Under Secretary of Defense (Personnel & Readiness) USD(P&R) and the Armed Forces Chaplains Board. For FP, the Army developed a draft implementation plan for the recommendations in this major area pending receipt of DoD guidance. In our internal review, the Army found that we possess sufficient policy guidance for implementing protection programs, but lack a synchronizing organization or synchronizing function within an existing organization. In most cases, FP policy guidance and programs require updates and/or actions to address unique requirements such as behavioral indicators, real time information sharing, integrated FP policies, internal threats, screening strategies and capabilities. As an example, HQDA conducts protection assessments of each ACOM, ASCC and DRUs once every three years by identifying trends and problem areas. If regulatory gaps are discovered, that information drives changes to Army policies. The synopsis of the findings and recommendations in the Information Sharing area was the lack of policy, procedures and systems for the sharing of threat related information between the Services, Combatant Commands, DoD and other federal agencies such as the Federal Bureau of Investigation (FBI). The inadequacy of information sharing between critical components of DoD’s FP enterprise was the common thread between each of the four findings and seven recommendations in this area. The Army helped to develop the initial policies being drafted by DoD to improve information sharing and will continue this effort until the policies are published. The Army also is working to address the internal information sharing issues found by the AIRT during the visits to specific Army installations. The Army identified and analyzed the Installation Emergency Response issues and is establishing working groups to further address areas of concern. The Army established Emergency Management (EM) as a formal program of record with the release of Army Regulation (AR) 525-27, Army Emergency Management Program. Department of Defense Instruction (DoDI) 6055.17 directs the Services to achieve Initial Operational Capability (IOC) no later than 13 January 2011 and Full Operational Capability (FOC) no later than 13 January 2014. IOC requirements focus on initial actions to field and utilize Installation Emergency Managers at all DoD Installations responsible for developing and executing the Installation Emergency Management (IEM) Program across all five phases of the emergency lifecycle: Preparedness, Mitigation, Prevention, Response and Recovery. FOC targets are a multi-year effort requiring the organization, manning, training, equipping and exercising of multiple capabilities across the EM lifecycle addressing all hazards. To attain FOC, the Army is establishing working groups, led by the G-3/5/7, to determine standards, requirements, baseline current systems and developed a plan for acquisition, fielding and sustainment to close identified gaps for implementing the following initiatives: an enhanced 911 (E911) system; a Mass Warning and Notification (MWN) system enabling commands to quickly and effectively warn the installation of emergencies and direct protective actions before, during and after an incident; and a Common Operating Picture (COP) capability enabling commands to quickly and effectively exchange information resource requests and coordinate response and recovery operations with civil and military partners. Additionally, the impact of the Fort Hood Shooting displayed the need for DoD to establish preventive measures as well as identify enhanced methods for emergency response personnel. The Army conducted extensive research and incorporated federal, state and local law enforcement best practices into the training curriculum, including ASR, for Army Civilian Police, Security Guards and Military Police (MPs). The U.S. Army Military Police School (USAMPS) developed an ASR Training Support Package (TSP) in March 2010 for Army Civilian Police and MPs. In Health Affairs, the Army found that it possesses sufficient policy guidance for implementing medical care to include policies that appropriately addressed behavioral health conditions. The Army’s OTSG and MEDCOM developed the Comprehensive Behavior Health System of Care Campaign Plan for incorporation into the Army Campaign Plan. Its purpose is to clearly delineate existing policies, procedures and guidance to establish minimum standards for Traumatic Event Management (TEM), Soldier and Health Care Provider support. 1. In an active shooter scenario, the response is action, not cordon; the Office of the Provost Marshal General (OPMG) and the USAMPS, with the assistance of the G-3/5/7, now trains all military and civilian law enforcement to respond with proven tactics. 2. MPs are now authorized to use jacketed hollow point ammunition to reduce the risk of injury to innocent bystanders. 3. The General Officer Management Office revised General Officer assignment orders to expressly reflect senior commander authorities, responsibilities and duties. 4. General Officers selected as a senior commander are required to attend the General Officer/Senior Commander Course at the Army Management Staff College and are trained on the Army’s EM program to improve their understanding prior to an actual emergency. 5. In order to identify internal and external threats to Army personnel, the G-2 initiated a rapid revision and re-titled AR 381-12, formerly Subversion and Espionage Directed Against the Army (SAEDA), now Threat Awareness and Reporting to include additional observable indicators for espionage, terrorism and extremism. The AR has completed legal review and is waiting for approval from the Army Publishing Directorate. 6. The Army developed and implemented the iSalute CI reporting system via “Army Knowledge Online” and “Army Knowledge Online – Secure” internet based reporting links in April 2010. The G-2 and Chief Information Officer/G-6 developed and implemented the reporting platforms enabling any Soldier or civilian with an Army Knowledge Online or Army Knowledge Online – Secure account to report a suspicious activity to Army CI. 7. The Army’s new iWATCH program promotes anti-terrorism across all commands and leverages every member of the Army community as a sensor with reporting at the local level. 8. As a new paradigm for dealing with trauma regardless of origin, the Army implemented the TEM Course at the Army Medical Department (AMEDD) Center and School. This course trains behavioral health providers, related healthcare professionals and Unit Ministry Teams in traumatic event management and standardizes how the Army will provide trauma management. 9. The Army Surgeon General and MEDCOM implemented Care Provider Support training to teach healthcare providers how to manage stressors unique to providing health care. 10. The United States Army Crime Center, in concert with the FBI Criminal Justice Information System (CJIS), amended the CJIS Security Policy authorizing contract security guards (CSGs) access to the National Crime Information Center (NCIC). This change enables installations without law enforcement personnel the ability to conduct criminal checks on civilians attempting to enter the installation. The above demonstrates that the Army can quickly adapt, but there are enduring FP challenges that require discipline. The Army must address a number of important initiatives in our standard management forums: Force Structure Panel, concept plan approval process, the Budget Requirements and Programming (BRP) board process and establish decision points in the Army Campaign Plan. There are a number of initiatives the Army must implement in order to address systemic challenges with our current procedures to protect the force. In order to move forward, the Army must address these issues in our standard management forums, such as our force structure validation process documented by the concept plan approval process and our BRP, all tracked by establishing decision points in the Army Campaign Plan. Our current protection procedures fall short of synchronizing policy, establishing priorities and allocating resources to achieve the desired end state. The Army senior leadership is not given the opportunity to affect the end state because they cannot review the portfolio of protection related functions on a recurring basis. The Army must implement goals and objectives as directed by the Secretary of the Army in his directive on Army Protection in April 2008. In this directive Secretary Geren clearly designated the G-3/5/7 as the staff agent responsible for Army Protection Policy. Implementing this directive corrects shortfalls in how we implement policy, prioritize requirements and program necessary resources to meet current and emerging protection requirements at our installations. Our current process does not synchronize all Army protection-related functions into a coherent program to maximize security providing unity of effort. As an example within the EM function, we will likely fail to meet National Incident Management System (NIMS) IOC and FOC mandated milestones, unless we transform how the Army manages this program. Additionally, the Army must adapt to procedures put in place since Secretary Geren signed Army Directive 2008-02. ACSIM has proposed changes to the 2011 Army Campaign Plan that identifies “Provide a Safe & Secure Working & Living Environment” as Major Objective 2-7 which is nested in Campaign Objective “Provide an Effective Protection Capability at Army Installations” (see Appendix G). The Army should designate the G-3/5/7 lead for Major Objective 2-7 as part of the Army Campaign Plan process. Currently, installation commanders identify and prioritize EM equipment they need. Equipment is not direct funded, procured locally and must compete for sustainment. We recommend that the Secretary of the Army direct the establishment of an Army funding line for centralized management of the equipment and the Army Acquisition Executive appoint a Program Manager(s) with resources and authority for life cycle management of EM equipment. The Army must designate this equipment as “programs of record” and program the funding necessary to achieve both IOC and FOC as outlined in current DoDI and the NIMS and National Response Framework (NRF). The team found the legal authority of CSGs to respond to an active shooter threat is unclear. The lack of clarity is exacerbated by the multiple types of jurisdictions on our installations: exclusive (Federal), proprietary (State), or concurrent. Over the past nine years, the Army has relied heavily on CSGs. This is changing. IMCOM is actively converting its 1,679 CSGs to Department of the Army Security Guards (DASGs) and will complete force revisions by the end of FY 2010. In the years since 9/11, the Department and Service Secretaries contracted for increased performance of security guard functions on the authority provided in periodic annual National Defense Authorization Acts. In this era, the Army must anticipate “in-sourcing” and consider how to bridge FP requirements with available resources. The effort to convert CSGs to DASGs did not extend to non-IMCOM installations and there is confusion associated with their capability, authority and risk associated with their use. Currently, AMC has 540 CSGs and the United States Army Corps of Engineers has 79. We need to ensure that we can respond effectively to an active shooter scenario, especially at Army installations without a installation commander (“non-traditional/separate facilities”). We also need to ensure that CSGs receive training on the new active shooter scenario across the Army. The Army must definitively establish the limitations of authorities for CSGs given the various jurisdictions in which we operate. We recommend that OPMG lead a cost-benefit-risk analysis to determine the best means for FP and security at all installations, including non-traditional/separate facilities. The Army must use this analysis to establish clear policy and procedures regarding the authority and actions of CSGs in response to an active shooter and a standard equipping package for all Army security personnel. Several initiatives will affect force structure of the garrison staff. As an example, the Army concurred with DoD’s recommendation to use the FBI’s e-Guardian System reporting suspicious activity. This action will result in an increase in personnel and equipment requirements across the Army. Another example is where installation commanders reported that they did not have the resources to adequately conduct installation threat analysis and that they do not receive necessary levels of external support for threat analysis. Consequently, the G-2, G-3/5/7 and OPMG are working to develop a strategic information sharing concept to provide timely information, allowing installation commanders access to critical information aimed at protecting their force. This concept plan uses a combination of information sharing technology and personnel to ensure robust information sharing that should be presented to the ASA(I&E), then forwarded to the G-3/5/7 for validation. We recommend the Army develop an installation staff Battle Command Training Program which could result in increased resource requirements for both the installation and US Army Training and Doctrine Command (TRADOC). Lastly, to enable IOC and FOC for IEM, the Army will require trained and certified EM professionals. We must efficiently and effectively transform how we look at protecting the force. 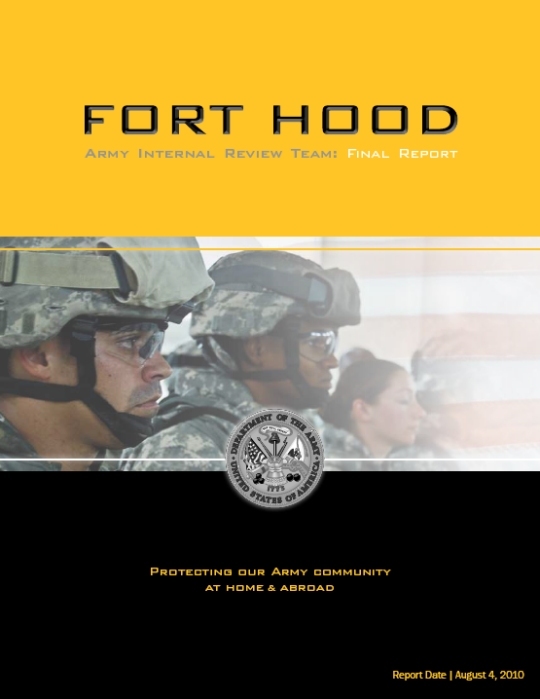 Many of the DoD Independent Review Panel recommendations and the emerging ideas developed by the Fort Hood AIRT require further staffing and policy review for a complete solution. The Army must ensure that an enterprise approach is used to further develop our recommendations and emerging ideas. The approach must using existing forums, such as the SICE Board, to fully vet and present to the Army Senior Leadership for decision as part of the Army Campaign Plan. As part of the vetting process, the Army must also take this opportunity to explore other Services’ solutions and collaborate with the Office of the Secretary of Defense (OSD) to ensure success against our Nation’s internal, external and asymmetric threats.